Jodie, Jodie, Jodie...what were you thinking? I'm not sure how this appeared like a good script, but I guess everyone makes mistakes. (If you really still want to rent this, stop reading, I'm about to give about the jist of the movie.) To summarize: Divorced woman (Foster) and her 12-year oldish daughter who I thought was a boy until about 30 minutes into the movie when I realized they were calling her Sara is recently divorced from an apparently wealthy man. She buys this enormous house in Manhattan. When I say, enormous, I mean B-I-G, huge! Apparently whoever owned the house previously had passed away and left $22,000,000 unaccounted for. And, of course, unbeknownst to Jodie and Sara, it's hidden in the "Panic Room," a special hi-tech room built into the house which completely isolates you from the outside world in case of an emergency. (It does contain surveillance cameras which allow you to watch your entire house.) A bumbling trio of low-life thieves break in to find the missing $22M. Jodie and Jodie Jr. flee to the "panic room." And there-in lies the problem. The thieves want IN to the panic room to find the money. I dunno...maybe there's a foundation for a good movie in there somewhere, but as it was it just didn't do anything for me. It's filled with too many gratuitous "close-calls," and way too much bad luck to be realistic. For a perfect example, the daughter OF COURSE is diabetic, and is on the brink of falling into a coma because they are trapped in the panic room for so long. They also seemed to want you to actually LIKE one of the three "bad guys." That didn't play out real well, and the entire inter-relationship of the three-some seemed a little cheesy and stereotypical: one guy just wants to do the job and not hurt anyone (awwwww, isn't that sweet), one guy is the self-proclaimed mastermind of the heist but has everything screwed up, and the third guy is the usual psycho who would be willing to kill his own mother to score. Just cheeeeesy. Speaking of gratuitous, nice shirt they had on Jodie Foster for the whole movie, not to mention the strategic camera angles to get the best cleavage view. That was worth at least a half star. Hehe. I liked and was caught up in the story line, but I admit this movie is primarily a vehicle for Robin Williams to do his zany comedy routines--cleaned up, of course, for the big screen. I do, however, like Williams so didn't mind this aspect of the movie too much. If I could describe this movie in one word: Delightful. And I don't think I've ever used the word "delightful" in any context, but this movie gave me my first opportunity. 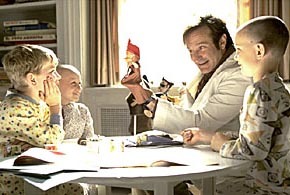 If I had a stronger character myself, Patch Adams is the person I would most want to be. It's the person we should all want to be. This was a truly touching - and delightful - movie. The story - a true one, although you have to wonder just how much of it was embellished for the sake of the movie (the butterfly scene leaps to mind!) - is about a virtual genius down on himself and life at the start of the movie until realizing he has the gift of making other people happy and bringing out their best - both mentally, and ultimately physically. (In reality, it's not so much a "magical" gift as it is just an understanding of human touch.) The movie covers his life from the realization of his "gift" through graduation from medical school. Robin Williams has appeared in some real "clunkers" over the years - Popeye, Toys, Hook, Flubber, Millenium Man -, but when he makes a good one, he makes some of the most remarkably entertaining movies of our time - Good Will Hunting, Good Morning Vietnam, Awakenings, The Fisher King, Mrs. Doubtfire. Add Patch Adams to the latter list. The Patriot is an action-packed historical drama centered on a man (Mel Gibson) torn between preserving his family and leading a group of militia in the American Revolution before realizing that to save the lives of his family and the freedom of his countrymen, he must help the cause. Together with his son (Heath Ledger), they face the "evil" British redcoats in an adventure of heroism and stubborn pride - not to mention a lot of action (once the film actually starts to roll) and a lot of painfully realistic bloody battle scenes. The audiences range of feelings is masterfully swung from love, revenge, hatred, honor, dignity, bravery, fear and back again. Keeping this film from a better rating where some minor flaws such as the the flagrant twisting of history to make for a more dramatic story. First and foremost - and I guess this is actually a MAJOR flaw now that I think about it - for anyone who was wondering if the British were really that evil and cold-blooded - THEY WERE NOT! History books will show that the Americans and the British pretty much fought the entire war "by the books". There were not any documented cases of the British slaughtering innocent women and children, murdering wounded and surrending Americans, and burning down churches full of people!!!! Jeesh, c'mon! That was a terrible twisting of the history books. Additionally, the romanticizing the treatment of slaves during that period of time seemed purely an effort to add nobility to Gibson's character. Ironically it was the "evil" British who banned slavery long before the Americans. The movie is a good vehicle for showing the ugliness of war even 200+ years ago, and the painstaking bravato of our forefathers. It was a little unfortunate, however that it was more a fabricated story of a man's revenge of his son's death (which turns into your stereo-typical good vs. evil movie) than it was a realistic story of our country's history. And why throw in the two brief romantic scenes between Gibson's character and his character's sister-in-law? That all seemed just a little weird and unnecessary. Oh, and the movie was a bit too long too (2 hours, 45 minutes). In "Pay It Forward", Kevin Spacey plays a Junior High School Social Studies teacher who challenges his students to a year long extra credit project to "Think of a way to change the world, and then implement your plan." Haley Joel Osment, of "Sixth Sense" fame, plays an energetic, irrepressible and thoughtful student who decides that he can make the world a better place if he selflessly helps three people in some dramatic fashion. Then, in return for his three good deeds, those people don't "pay it back", they "pay it forward" by agreeing to do the same for three other people. Helen Hunt plays Osment's single-parent seriously-alcoholic mother. And here is always the tell-tale sign that a movie is just average: Bev fell asleep about 3/4 of the way into the movie. She and I both agreed that the concept of the story was a good one, but there was something about it that could have been done better. Personally, I think some of the writing was weak - there were a number of times when I thought "Wait, a person wouldn't have acted that way in real life in that situation." Tell-tale sign of poor writing. The ending was also about as hokey as you could get. I really think they could have just cut the ending out of the film completely and nothing would have been lost. I also thought that Helen Hunt was poorly cast as a trailer trash alcoholic. The fact that she was billed second behind Kevin Spacey when Osment was really the main character tells me that Hunt was chosen only in an effort hitch another big name to the film. Spacey is his usual brilliant self, and I still love that Osment kid. I hope he continues to land big roles in future feature films - he's fantastic. All-in-all, an average movie. This movie is based on a best selling novel, proving that good text doesn't always transform into good cinema. I say you should all "Pay It Forward" and tell three friends that they should only rent it if they can't find anything better at Blockbuster. OK, I must be a real simpleton because I totally do not see why just about every critic thought this movie was a disappointment. I thought this was the best movie that I have seen so far this year - tremendously moving, excellent in every possible way. If you are at all patriotic, I don't see how this wouldn't give you chills. I thought the writers did a fantastic job in explaining all of the events that led up to Pearl Harbor by writing them into a story about two Navy pilots (Affleck and Hartnett) and a Navy nurse at a Honolulu hospital (Beckinsale.) Not only was the fictitious story of their relationships highly interesting and heart-wrenching, but the true story of Pearl Harbor is told so well that it serves as a patriotic reminder with pin-point accuracy the horror felt by anyone who lived through that day. The complaints that I heard prior to seeing the movie were that 75% of the movie is just a love story that has nothing to do with Pearl Harbor. Not true. What did the critics want? 3 hours of ships blowing up? Sure, there is character development - isn't there supposed to be? In fact, the existence of that part of the story was the glue that linked each part of the story of the war itself. Without characters to follow through the war you wouldn't have anything more than a Pearl Harbor documentary, would you not? Regardless of the reasons for the need for a war love story, I found the three main characters played by Affleck, Hartnett and Beckinsale believable, likeable, and all very charming and charismatic. That part of the story really did stand on its own. And, it served as a gripping parallel to the overall story of the movie, which was the story of the attack on Pearl Harbor. What no one seems to disagree with, the battle scenes are worth the price of admission. I can honestly say, there was nothing about this movie that I did not like. HIGHLY recommended. Ah, the joy of the Hollywood formula! Historical events reduced to hokey instant romances, overheated acting, overbearing music telling us every emotion to feel and every second to feel it, effects overkill, noise overkill, and overkill of damn near everything else! Oh, well--at least in Pearl Harbor's case, the result is still a watchable yarn. It helps that the Strong-headed, Beautiful Woman is a pretty decent actress (Kate Beckinsale, who does an American accent quite well--my theory is that she was cast to placate those in her homeland upset about Renee Zellweger playing Bridget Jones) and that at least one of the Two Young Handsome Heroes Competing For Her Affection (the Bold One, Ben Affleck) is a likable and skilled actor (the Shy One Who Has to Prove Himself, Josh Hartnett, isn't horrible, but doesn't make as good an impression). It also helps that the filmmakers created a fairly decent invocation of mid-1940's America, without any truly awful anachronisms. While they were at it, they made some adventurous casting decisions, recruiting Jon Voight (Jon Voight!) to play FDR and Alec Baldwin to play the eccentric Colonel Doolittle, leader of the famous retaliatory raid on Tokyo six months later. They made a good choice to emphasize the young cook who became the first black sailor to win the Silver Star by manning an antiaircraft gun on the Arizona after its crew were killed (played well by Cuba Gooding, Jr.) They even went out of their way to humanize the Japanese without apologizing or implying that the Japanese leadership wasn't responsible for the attack, although they did include General Yamamoto's hesitation and mixed feelings about the whole enterprise. So why didn't I like it more? I guess it was the whole over- thing I mentioned--over-formulaic, over-noisy (my wife complained about the soundtrack overwhelming her hearing aids), and even a bit overlong at three hours (and I'm usually the person who wants movies to be longer). In addition, like other reviewers, I wish Gooding's character would have been given more screen time--a movie specifically about him wouldn't have been a bad thing, even. I'm not sure why I gave this film a 3. Probably because the battle scenes were pretty incredible. As a love story this movie bombs big time. The love triangle of Affleck, Beckinsale and Hartnett is so weak you can see everything coming from a mile away. You would think that in a three hour movie you would have plenty of time to get to know the characters involved...surprise, you don't. Cuba Gooding Jr. probably has the most interesting role, playing Dorie Miller, a ships cook who became the first black sailor to earn the Navy Cross. Too bad he had about a total of 5 minutes in the film. Go for the battle, it was worth the price of admission. I can only imagine the surprise and shock of this attack and I think the movie did a great job of recreating the disbelief of what was actually happening. To me, the best line in the movie was that of a nurse at the hospital in the midst of all the horror and panic who just said "I don't know what to do." And I would think, neither did anyone else that day. The Perfect Storm is a movie about a swordfisherman in Boston (Clooney) who, in his efforts to make "the big catch", gets caught out in the Atlantic with his crew in the middle of a hurricane. This movie is "based on a true story", and I put that in quotes for a good reason. (BIG NOTE: IF YOU PLAN ON SEEING THIS MOVIE, STOP READING RIGHT NOW!) The boat ultimately sinks and no one survives. Now think about that for a moment - if no one survived, then there is no possible way for anyone to know exactly what happened to them out at sea during that storm. The only thing legitimately "true" about the movie was that there were fishermen, a storm, and they never returned. C'mon. I guess "The Lion King" was based on a true story because there are, in fact, lions. One part of the movie that I didn't care for was the unnecessary "fisherman rivalry" that was built into the beginning of the story. Maybe that's really how they act, but it seemed a little bit forced into the movie, out of place and unnecessary to the ultimate plot. It was hard for me to begin routing for someone to catch more fish as if it was an aging journeyman outfielder trying to regain the stardom of his youth, if you know what I mean. There is also a question of routing for these people who took known risks, although you get caught up in the dramatic, and the strengths and weaknesses of the lovable misfit crew. I easily overlooked the fact they didn't really deserve to be felt sorry for. A sub-plot was built into the movie, kind of unrelated to the fishermen, where the Coast Guard was rescuing people from the hurricane out in the ocean. I would love to know if those scenes were at all realistic. If they are, my hats off to those people - they should be the highest paid profession of all-time. It's been eons since I saw this movie in the theater. Worth seeing alone for the opening scenes of everyday life in Philadelphia--let alone the excellent acting by Tom Hanks, Denzel Washington, Jason Robards, et al. The movie rang true to life and demonstrated compassion for people with AIDS. I agree with Mal that it was Oscar-worthy and that the opera scene was too long. Ambulance chaser (Denzel Washington) takes an idealistic job for once, representing fellow lawyer (Tom Hanks) fired for being gay and having AIDS; likable and moving, with great performances from leads. I sort of liked the opera sequence... Although its aftermath is what's really important. This is a true story about a lawyer in Philadelphia who has AIDS (Hanks). The movie picks up at the point where he is given his law firm's biggest case. Upon learning that he is AIDS and assuming that he is gay (which he is), the firm sets him up to appear as though he nearly ruined the case and then fires him for incompetence. Another lawyer (Washington) reluctantly agrees to represent him in their attempt to sue. Philadelphia was nominated for FIVE Academy Awards and rightfully so. This is a gripping, heart wrenching, emotionally powerful story that will shed a lot of well-deserved light on the prejudice surrounding people with AIDS. Can you beat this cast? Hanks, Denzel, Robards, Banderas?! Tom Hanks won an Academy Award for Best Actor of 1993 for his role in the movie, and I can't disagree with that selection. He was fantastic as always. The only bad thing I can say about it is that I could have done without the "Opera scene". It seemed to go on a tad long and was just plain...weird. I'd be curious to know what others thought about that moment in the movie. Other than that, "Philadelphia" was truly excellent. Very much recommended. I saw previews for this movie months ago and have been waiting for the release ever since. Unfortunately, with the "DC Sniper" drama unfolding at the time, the powers-that-be sat on the release for a while. I'm not sure if that was a good or bad thing. Colin Farrell plays Stu, an arrogant, ill-mannered, wannabe PR man who has his poor, unpaid "assistant" follow him around taking calls, making calls and lying to his clients while Stu just tries to be impressive in his Italian suit and good looks. But all is not as it seems in Stu's world. He uses the promise of his "connections" to try and lure young Hollywood hopefuls into the sack. And by the way -- Stu's married. As we watch Stu maneuver and manipulate, we find that he uses the same phone booth every day to call one of his starlets so that the call can't be traced back to his cell phone by his wife. Bad move. Someone has been watching Stu and they want him to pay for being devoid of morals. That's when the movie starts to get intense. Stu is in a phone booth, on the line with someone who knows everything about him, everything about his life, everything about his wife and flings and is not happy. It's unnerving to see Stu go from cocky to crushed, all while the whole world watches. You'll have to see the movie to know what I mean by that. "Phone Booth" isn't a great film, but it's an intense film. Not much action, but Colin Farrell is superb at portraying a man unglued. He is the movie. Don't get me wrong -- the voice on the other end of the film plays a huge part, but it's not until the bitter end that you even notice who it is. It's Farrell that keeps -- and commands -- your attention. And all while doing a dead-on Brooklyn accent. This is truly a worthy rental. Black & white independent film with a very unique plot. Avid mathematicians will appreciate some of the theories discussed throughout the film more than others, but my "math for English majors" mind wasn't too overloaded. Great direction and unusual camera angles. Not for those who enjoy "meat and potato" movies. 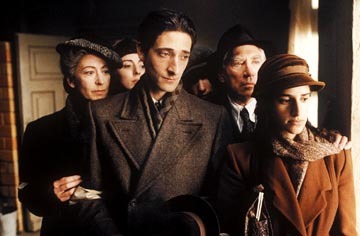 The Pianist is a one-man epic based on a true-story of a Polish Jew and his miraculous survival during World War II and the Holocaust. It takes you beyond the horrors of evil - to the absurdity of it all. This film is not, however, a thriller, and avoids most attempts to build up the suspense. But, I probably shouldn't even mention that because it did not detract much from the sharp dagger that you feel pressing against you and the knot in your stomach as you watch the story unfold. You'll feel their brutal pain, frustration, anger...and the unending shower of hatred cast upon them as they are essentially exterminated one after the other - except for this one man who managed to stay alive. And he stayed alive in the end thanks to help from the outside, help from the unlikeliest of places. Very well done. It's a movie you should see. If you can wait for the video do so, you'll lose nothing by seeing it on TV. This was a horrible movie. Maybe not the worst movie I've ever seen, but it was bad. I have liked Mark Wahlberg since he starred in "Fear" in 1996 (an EXCELLENT movie, particularly compared to this one), but didn't he read the script? Actually, he didn't - I just read that Wahlberg was so excited about working in this film with director Tim Burton that he signed on before the script was written. Oops. The dialog was absolutely horrendous. It was so bad, in fact, that I found myself chuckling out loud a couple of times right in the theater. Consider these gripping lines from the movie: "Look! ", "Run! ", "Follow me!" Cheesy lines drip from nearly every character. The only things saving this film from the dreaded "1 star" are (1) the ape-people are frighteningly realistic, their make-up is stunning - as is the case with more and more movies these days, the line between what is real and what isn't is almost totally blurred -, and (2) I really did think they had a good basic plot to work with. That's really the sad part. There was an opportunity to make something out of this. I really thought ape vs. man was going to be a role reversal parallel to how whites had/have treated blacks, but they missed the diversity angle so badly that it was laughable. Was there ANY character development at ALL in this whole film? And what was with the way human's were "launched" after being punched by an ape? And better yet, why could the Apes punch a human and make him soar the length of a football field, but when two apes would get in a fight they'd punch each other like girls? And can someone explain why, at the beginning of the movie, humans are treated like a valuable slave-trade, yet a 1/3 of the way in it's pretty clear there are humans everywhere for taking, and are simply slaughtered left and right? And the ending! Surprise? Yes...but so what - it was idiotic. Let me rewrite a better ending for you...the monkey comes flying down on his little ship just as he did in the movie. Monkey jumps out of the ship and runs into Wahlberg's arms. The Apes realize that monkeys and people CAN get along...credits role. What was with the rest of that crap that they actually wrote into the movie? Ew. It was embarrassing. Wahlberg just stands there saying nothing in the closing scene in utter disbelief...umm...he wasn't alone! I'm having a difficult time figuring out how to describe my feelings about this movie. Clever, yes. Unique, yes. But, unfortunately, too clever and unique for its own good, turning the movie into something just mildly bizarre - my facial expression didn't change from curiously perplexed for the length of the movie. The writer clearly had this "cool" idea to make a movie where the main characters were sucked into a "make-believe" black-and-white 1950's-ish "Leave-it-to-Beaver" sitcom type of world where everything was wholesome, innocent and perfect. When I say "black-and-white" I mean, literally, black-and-white. The moral that a life without troubles, difficulties and lows makes the highs meaningless and mundane was, indeed, a fun start. As the two main characters (Daniels & Witherspoon) from the "real" world corrupt this perfect little world, the people in this "perfect" town called "Pleasantville" begin to gain color and realize that a "perfect world" isn't necessarily a good thing. Unfortunately, there didn't seem to a good way to introduce why they were sucked into this world, and there was even less of an explanation as to why and how they were getting out. I suppose that isn't a very big deal. The big deal is that despite the clever plot, this movie was just mildly boring, too slow at times, too bizarre and a little bit too long. Usually an interesting and unique plot goes hand-in-hand with an entertaining movie - not in this case. All-in-all, a very average movie. It was the best movie ever and it had all the pokemons and they got in this fight and the pokemons evolved into different pokemons and there was fake pokemons but I could tell who the fake ones are and these kids sitting behind us couldn't tell the difference they were so dumb and we went to Burger King and I got pokemon trading cards and now I have over 200 cards and my dad says he's gonna use them to start a fire in the fireplace and I got game boy color with pokemon pinball for my birthday and for Christmas I want more pokemon stuff and and and...I think that's it. If you know nothing about Pokemon or have never watched the cartoon program on TV (like I have religiously with my nine year old daughter every morning at 7am before school) don't bother, you won't understand anything and will think it is strange. I, on the other hand, I like Pokemon and thought the movie was good, not great but good. If you aren't proficient at naming the Pokemon (there are 150) and don't understand how they "evolve", give it up and don't go. But if you really want to impress a 6-12 year old, take them. This movie should have been rated CG12+ (a new rating where anyone over 12 is not allowed to attend.) I couldn't find one adult who didn't fall asleep during this movie. Why couldn't they run another movie parallel to this one so that the kids could see this and the parents could sneak off to something more entertaining? I give this one 3 stars - that's an average of the "5" that my kids would give it, and the "1" that I am giving it. Have not seen the film nor do I ever intend to unless tortured in a POW camp. But haven't we had enough experiments in the "how dumb are people" genre? Let the aliens come. They're bound to be disappointed. Oh, and it got .5 stars because my finger slipped when hitting the zero. The Polar Express is a wonderful movie. I give it 5 stars because I still cry when I describe it to people. That's a sign of a good movie. If you don't like this movie (like the fellow at Newsweek)... chances are very good that you'll be visited by three spirits come Christmas Eve... but that's another story. The animation was better than incredible. (Pun?? What pun? I have no idea what you're talking about.) The story was sweet and heartwarming and everything a Christmas movie should be. I was fortunate. I got to watch it while holding my five year old daughter on my lap. I heard h er gasp as the train plummeted like a roller coaster. I heard her sigh when she saw the North Pole for the first time. I saw her eyes light with wonder when Santa appeared. I admit all of that may have contributed to my overall sappy regard of this film. I only know I loved it, my kids loved it and the theater was packed and everyone applauded at the end, so I'm guessing they liked it too. We can't all be wrong, can we?? One complaint, a minor detail really. Probably shouldn't even mention it... but, of course I will. There were millions upon millions of elves in this movie and not one of them in any way resembled Orlando Bloom. One looked like Steven Tyler, why not add a little Legolas in there? What? Tom Hanks couldn't pull off the Elven thing?? Anyway, besides that very trivial detail... it rocked. Go see it. Polar Express is in the same genre as movies like Shrek, Toy Story and Finding Nemo: Animated films of a new generation. And as far as animation goes, this movie takes it one step higher on the ladder. It's truly astounding what they are able to conjure onto the screen these days. Unfortunately, the story itself didn't measure up to the aforementioned Kings of Animated Film. This was clearly "just a kid's movie" (although I didn't fall asleep or anything), where The Big 3 were entertaining for all ages. Still, I think if you'd play all 4 back-to-back to any kid for the first time, this one would still rank last. I guess that's an unfair comparison, though, and is more a testament to Shrek, Toy Story and Finding Nemo, than it is being critical of Polar Express. I'd put this one more on par with Monsters Inc., Toy Story 2, A Bug's Life or Shark Tale. If you liked those, you'll like this one. All-in-all, a nice Christmas movie for kids 5 thru 8, and an interesting display of modern cinema technology for anyone interested in that sort of thing. If you don't fit those two groups, I'd wait for the rental.